Over the last few months I have been working with the AIMS team at Hull University. 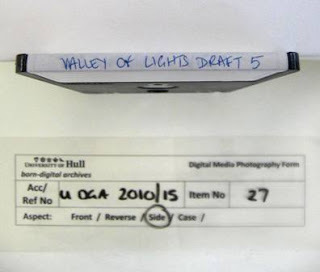 My role entails getting stuck into some practical processing of the born-digital collections in the Hull University Archives as well as planning aspects of digital preservation. A lot of our work so far has been to discover and document the material that we already hold in what we thought were purely paper collections and I have written a workflow for the discovery of these items and their preparation for ingest into Fedora. As part of this workflow we decided to photograph all of the removable media we currently have and create a process for photography of new deposits when they arrive. By retaining photographs of the original media alongside content we will be able to provide an image of the appearance of the original media to researchers if they request it. For the foreseeable future we are storing the image files on a shared drive, but they will eventually be stored as an element of metadata with the digital files in our Fedora Repository. We will be dealing with large numbers of media items so need to ensure consistency in the way the media is photographed and information recorded from those images. Having not previously numbered the discs, we decided on a simple running number within each accession. Despite our familiarity with labelling paper material, it seemed more complicated with digital. Our conservator advised against sticking labels (even conservation grade) onto the plastic casing of a floppy or Amstrad disc. Though a specialist CD marker can be used to label CDs, we were reluctant to permanently mark the items! After a worryingly long thought process we decided to stick to the old faithful method of writing in pencil on the existing label or case. I then started planning the process. Despite trying to anticipate the different elements of information to include for each media type, it was only trial runs photographing actual media that gave the full picture - i.e. that Amstrad discs have three aspects to photograph (Side A, Side B and the edge). 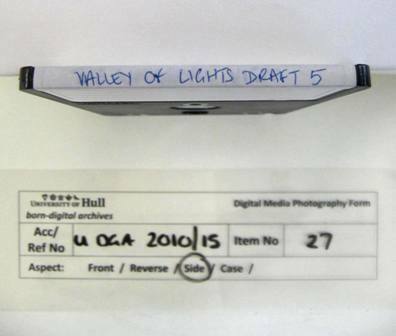 Lots of seemingly trivial questions arose - like whether to photograph the case or whether to photograph a label if blank. Getting the process right from the start will save time in the long run. We decided to create a ‘clapperboard’ to photograph with the items for a failsafe way to ensure easy identification. I decided on a reusable form printed on a transparency which we can label with a drywipe marker. Putting theory into practice needed several trial runs; after each one I adapted the form and the procedure. In addition I wrote up detailed notes describing the procedure for each type of media we anticipate encountering. We worked out a sensible image quality – so to ensure legibility of the labels without clogging up our servers with unnecessarily large images. Once the photographs have been taken they are renamed and filed. We also maintain an inventory of the items and record the media and label information alongside it. This ensures that if we send items (like our Amstrad discs) away to a third party we can match them to our records when they return. This process has been satisfying to complete and enables us to tick at least one thing off our to-do list. Anyone can get this part of the process completed – even for material which is stored on a shared drive, photography of the original media is a useful process.